Like Kalos and Hoenn before it, the Tenno Region also has it own Mega Evolution Pokémon. Mega Stones from the Tenno region come from special rocks that fly through outer space, bombarded by cosmic rays. These rays transform the rocks, granting them the power to Mega Evolve a Pokémon. 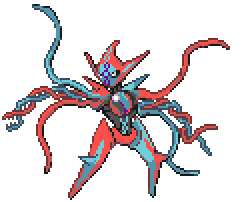 Due to Pokémon having two abilties at time, most Mega Evolutions in Tenno gain one “Mega Ability” while also retaining one of their base form’s abilities. This page will be filled with Mega Evolutions as I make them, so be sure to check back. 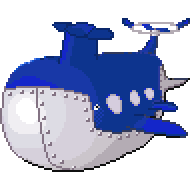 Description: Mega Wailord has the ability to dive to the bottom of the deepest trenches in the ocean and can easily withstand their high pressures. Its strong metal exterior makes nearly impervious to certain attacks. Its Defense, Special Defense, and Attack are all boosted, but its Speed is lowered. Gaining the Steel-Typing, Mega Wailord can now use moves such as Heavy Slam to its full potential (especially because it becomes much heavier upon Mega Evolving), as well new Steel moves added to its level up move set, such as Iron Head, Gyro Ball, and Iron Tail. 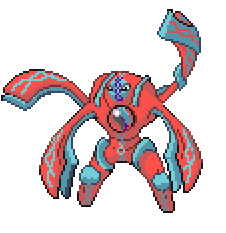 Description: Upon Mega Evolving, Deoxys’ Attack, Defense, and Speed Forms gains power, boosting each one’s specific stat(s). With it’s new ability, it gains the power to change form in battle with the new ability Transcription. Mega Deoxys will start off in the same form as it was before Mega Evolving, unless it was in Normal Form, in which case it turns into Defense Form. 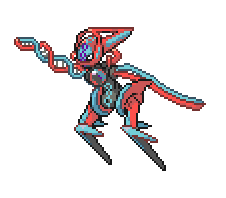 Transcription causes Deoxys to change form depending on what type of attack it uses. A move of 70 or more base power will change it into Attack Form, 69 or less power or a Speed Priority move will result in Speed Form, and a non-damaging move will change it to Defense Form. When it reverts back to normal, it will become whatever its form was before Mega Evolving. 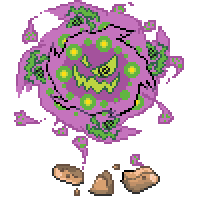 Description: The power of Mega Evolution allows for Spiritomb to break free from its Odd Keystone prison. The 108 evil spirits that form Spiritomb can now be seen orbiting it. Without the Keystone containing it, it gains great power, in the form of increased Special Attack and Speed. Its Mega Ability, Sinister Shadows, protects it from damage by Light and Fairy-Type moves, its only weaknesses. When it returns to its original form after battle, the mystic properties of the Odd Keystone cause it to repair itself, sealing Spiritomb once more, until the next time it Mega Evolves. Description: When Porygon2 was upgraded into Porygon-Z via the Dubious Disk, glitches soon became apparent. Using the power of Mega Evolution, a system update/patch was created in the form of a Mega Stone, thus creating Mega Porygon-Z. With its patch, Porygon-Z can now fully implement its original programming and travel to and from cyberspace at will using the portal that floats behind it. It can even travel to alien dimensions. It has increased Special Attack, Defense, and Special Defense. Description: The ferns that encompass Ferntress now grow even stronger and gain additional strength by weaving into armor plating, increasing its Defense and Special Defense. The shields on its arms are the strongest points on its body. It’s lower legs have also grown quite strong, so that it may better withstand incoming attacks. Description: Upon Mega Evolving, Solurtle’s solar panels now cover a larger percentage of its body, allowing it to absorb even more sunlight. These panels also double as armor. Because of this, Mega Solurtle gains a boost in Special Attack, Defense, and Special Defense, but the bulk of the armor causes a decrease in Speed. Suggestion: If Solurtle can Mega Evolve, shouldn’t Ferntress and Kappaquarius be able to do so too? Also, I’ve read the fanfic, huge fan. Actually, they can. I just haven’t got around to designing them yet, as they their Mega forms have yet to appear in Cosmic Quest. And normal Kappaquarius hasn’t even appeared at all yet. Hopefully it won’t be too long before I can put those ones up as well. Thanks for the comment, I’m always happy to hear from readers. Sorry, the old names just aren’t to appealing. Thanks for the suggestion. I’ll take it into consideration. Though, it’s worth noting that I went with the name Porygonzite, because I wanted it to sound artificial, so I’ll probably be keeping that one at least. Yeah, I’m not suggesting you to change everything. I see now about the porygonzite to sound artificial, and I love the name Deoxite!! Here’s the thing. I appreciate you trying to help me out and give me ideas, but just leaving the name of a Mega Pokémon/Mega Stone really doesn’t help me in any way. Due to the nature of Megas, it’s very easy just to take a random Pokémon and add Mega/-ite to its name, the actual difficult part is coming up with a concept and design. Because of this, I will likely not be using any of the Megas you suggested, and if I do, it will be a coincidence. Sorry. What is a mega evolution stone? Have you played Pokémon after Gen VI? A Mega Stone is an item a Pokémon can hold to allow them to Mega Evolve. Each species that can Mega Evolve has a specific stone that correlates to the species. Fun Fact: Pokemon wanted a Mega Flygon, but, um, didn’t do it because they couldn’t do a design. What about Sporout and Kappaqua’s final evolution? Are they gonna mega evolve with the mega stone too right here in the Tenno region? Those two will be getting Mega Evolutions eventually, I just haven’t been able to put them in Cosmic Quest yet, so they haven’t appeared on this website yet. Okay. That’s more looks like when Ash and Alain are make it good the final battle round right here in the Tenno region with their anger and frustration to have a best winner and loser. I’m guessing that Ash will have a mega evolution stone for Turcell’s final evolution so he can battle with Cosmo with Sporout’s final evolution as well make through for the final battle until this is going to be all the way through to the end of Pokemon trainers just like he did that to Alain when he loses to him from the Kalos region with his Ash-Greninja and he was defeated by Charizard X mega evolution. Pokemon mega evolution is the best way to make the old Pokemon like Noctowl, Swellow, Staraptor, Unfezent, Talonflame, Golduck, Slowking, Dragonite, Kingdra, Haxorus, Goodra, Luxray and Butterfree to mega evolve. Maybe you can put it there so they can be able to mega evolve into mega form. It’s that okay with you? Here’s the thing. You can’t just say you want to make a Mega Evolution for a specific Pokémon. That would be forcing the issue, and that is not good design. I make Mega Evolutions for Pokémon by coming up with a concept first. Without a concept, I can’t make Mega Evolutions for all the Pokémon you suggested. So unless you have actual concepts to suggest to me, I can’t take any of your suggestions. Okay. Thank you for the comments. I’m going to keep on read the stories about Pokemon Cosmic Quest to see what’s gonna happened that looks like a Pokemon mega evolution the final battle line anime.